At a London bank entrance, a man, using a swift judo chop, overpowers a courier carrying a valise containing a large sum of money that has just been withdrawn. Rushing past a surprised Barry Chan, the thief shoves a second valise into his arms as he continues his escape. Down the street, the thief tosses the money-filled valise into an alley just before a passing police officer stops him for his unusual behavior. Back at the bank, a confused Barry is questioned as Colonel Ross enters to access his safe deposit box. Alone, he opens a valise containing what appears to be the just-stolen money. At Scotland Yard, Inspector Marlowe enlists the aid of Charlie Chan to help solve a recent rash of bank robberies that have been carried out around London with "military precision." Two suspects from the most recent heist are brought into Marlowe's office, including Barry, prompting Chan to note his son's ability to be in the wrong place at the right time. The other suspect is a young man named Bill Shaw who has no prior criminal record. Paying a visit to Bill's father Chan finds that Bill belongs to a youth club run by Col. Ross and how his son looked up to the Colonel to the extent that he had even tried to join the Army commandos but was unable to do so due to his poor eyesight. Chan notes that Bill was wearing a very expensive watch at the time of his arrest, with Mr. Shaw insisting that his son had won it in a sports competition at the youth club at a local mission. Chan then asks Mr. Shaw where his son had learned judo. Just then Col. Ross arrives at the flat. Ross offers to supply a lawyer for Bill, but Mr. Shaw refuses stating that if his son is guilty he needs to pay the price. Visiting the St. Mark's Mission where Bill Shaw was active in sports, the mission padre and volunteer James Collins, also an employee at the bank that was robbed, relate that while Bill was no angel he had not shown any criminal tendencies. Back at his hotel room, Chan receives a call from Barry who has uncovered information that Col. Ross was killed in the commandos five years ago, prompting the elder Chan to pay a visit to the bogus colonel. Meeting with Ross at a local restaurant, Chan and Barry suggest that the youth club may have been something of a training ground for young criminals, to which the Colonel, incensed at the suggestion, leaves. Noting how his strategy was successful with the bogus colonel, Chan has also collected a nice set of Ross' fingerprints on a glass. At Brixton Prison, Barry meets Bill suggesting that he tell the authorities who put him up to the bank robbery. Bill, who has just turned 18 and will be tried as an adult, plays the tough guy until Barry notes how Colonel Ross has played him for a sucker. Meeting again with Collins and the Padre at the mission, Chan and Barry reveal the truth about Colonel Ross and suggest that should Bill Shaw be released from Brixton on bail that he may lead to both Ross and the stolen money. Bill's Father receives an anonymous phone call informing him that his son was set up by Colonel Ross. Barry, who is waiting outside of Brixton prison, is judo-chopped by an unseen assailant who then calls the police reporting a drunk who is passed out outside of the prison. The caller is the same person who had telephoned Mr. Shaw. As the police take the barely conscious Barry away, Bill Shaw emerges from the shadows. 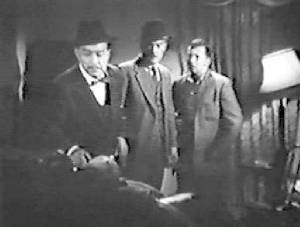 Back at Scotland Yard, Inspector Marlowe gives Chan a rundown of lengthy criminal record of the phony colonel whose real name is William Garden. Receiving a call that the Padre at the mission has posted bail for Bill, Chan, unaware of Barry's plight, believes his son it tailing the youthful bank robber to Ross. Expecting to find Barry at Ross' apartment, instead Marlowe and Chan find Bill with the body of the murdered Ross. At Marlowe's office the autopsy report reveals that Ross died of a broken neck. As Chan is puzzled as to the whereabouts of Barry, Mr. Shaw enters stating that it was he who killed Col. Ross. Dubious of his confession, Chan later notes that perhaps an expert in judo could have delivered the blow that broke Ross' neck, and only someone holding a black belt in that discipline could have the ability to deliver such a death blow, something that neither the young Bill Shaw nor his Father could do. Barry's arrival via the drunk wagon is noted by Chan who soon learns of the judo attack on his son. Given Ross' safe deposit box keys by Marlowe, Chan and Barry find at the bank that the box has been emptied by someone other than Ross. Chan is told that James Collins is the person in charge of the safe deposit boxes at the bank. Meeting with Collins, Chan tells him that he has found that he earned a black belt in judo while working for a bank in Tokyo. It was also he who taught young Bill Shaw how to use judo chops to assist in the bank robberies and had been working with Colonel Ross to plan the bank robberies. Suddenly Chan and Collins are engaged in a life or death struggle as both exchange judo moves. After he has finished off Collins, Chan explains to his son that he is a holder of a first degree black belt while Collins is "second class." Brixton Prison - The original buildings of Brixton Prison date from 1819. In 1862 the prison was sold to the British government and converted into a prison for females. Twenty years later it was again converted, this time as a military prison. In 1898, when it was returned to the Prison Commissioners, the prison's buildings were enlarged and improved. 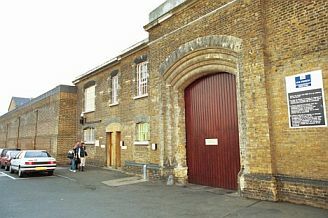 The prison now serves a number of courts in South London and houses a mixture of remand (cases on appeal) and sentenced prisoners. Charlie Chan (to Barry Chan): "My son, like in life, judo has many degrees. Your unworthy father was first degree." It is indeed a rare artist who can capture a woman's soul in a painting. Even the frightened fawn is aware of the hunter that seeks its life. I have a profound respect for female intuition. An artist's relationship with a married woman should be confined to paints and canvas. Strange, is it not, how wishes can sometimes turn into reality. There are very few motives for murder; one of the most profound is hate, and the most powerful hate grows out of the loss of a most powerful love. When a heart is full of tears, there is no room for understanding.